Contrary to the public’s widely held belief, fostered by Hollwood stereotypes, Tarot Cards are not one of the tools of the Traditional Witches. Nor are they standard fare for the iconic Gypsy fortune tellers, who are usually psychics and/or palm readers and who, when they do practice card readings, (cartomancy), generally work with regular playing cards. Instead, the Tarot is a form of divination that was adopted for use and refined into its modern form by much more modern neo-pagan religious movements arising out of the 19th Century. The popularity of the Tarot, as a modern implement for occult study, primarly came out of the Theosophy Movement , led most notably by the controversial Helena Blavatsky. This movment for the revival of the ancient mystical practices was the predecessor of what has now come to be known by the somewhat incongrous name of the New Age Movement. Other mystical occult groups of the period, such as the Rosicrucian Order, the Hermetic Order of the Golden Dawn and certain splinter groups coming out of Freemasonry, also picked up on the Tarot as a tool, originally for the purpose of spiritual insight, but later devolving into a tool for divination. The Wicca Movement, which evolved more from the ideas of these groups than from the underlying principles of traditional witchcraft, also picked up the tarot and has added it to their tool chest. Though the first Tarot decks appeared in the middle of the 15th century, it was not until the middle of the 19th century that occultists observed that the twenty-two cards of the Major Arcana, or trump suit of the Tarot, correspond with the twenty-two letters of the Hebrew alphabet and thereby with the twenty-two paths of the Kabbalistic Tree of Life. 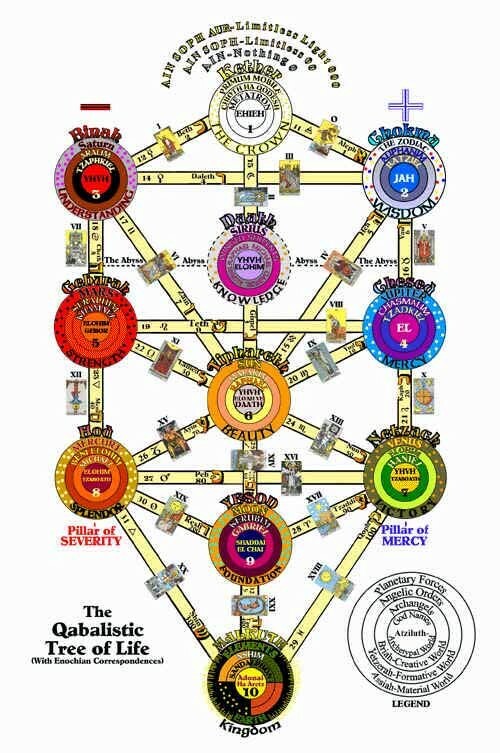 These mystical symbols, used in the Kabbalah of Jewish mysticism, set forth the path to God. These Victorian occultist then began trying to link the Tarot to ancient Eastern mysticism. Which may or may not be a factual lineage. for the Egyptian origin of Tarot cards." Although there is no consensus of opinion as the exact origin of the Tarot, it is fairly clear that the modern incarnation, with which the general public is familiar, evolved out of an attempt by some of these Victorian Age theosophical thinkers to validate and popularize their movement, (and by association their interpretation of the Tarot), with the ancient mystical practices of the Egyptian and/or Kabalistic religious orders , though this theory of the Tarot's origin has been fundamentally discredited by subsequent historical research. its abuse is an obscenity in the inner and a folly in the outer. The great problem that has arisen from this popularizing of the tarot is that it has fostered and image in most people's minds, of a gypsy woman at a small candlelit table, foretelling the future with a tarot card reading. It all seem strange and mysterious, and with most tarot decks being manufactured by playing card companies, it seems to many to be just an amusing game to be played for amusement. The Tarot is not a game! According to the founders of the Hermetic Order of the Golden Dawn, "the Tarot aids in coming in contact with one's Higher Self by drawing on powerful sources of information that come from within”. This means that although it is common for people to think that the Tarot deals only with fortune-telling and revelations of their past, present and future, the true Tarot represents a connection between the spiritual realm and the material world and unveils the path of initiation into the Sacred Realm that is hidden within us all. “For me, Tarot is a Bardic Art, and what people are looking for is their story. It is essential to have good storytelling skills to be a good reader."